The stunning ProdecoTech Outlaw SS, one of the first muscle e-bikes on the market, was born to become the newest American icon. This Candy Orange Metallic version of the hot new Outlaw Series carries a top speed of 28 mph, which is guaranteed to take your riding experience beyond the wildest of e-bike imaginations. Equipped with a 750-watt, rear direct-drive hub motor, which delivers 1200 watts at peak, and a range of up to 20 miles per charge, the racy Outlaw SS features a double-crown magnesium suspension fork and SRAM 8-speed X9/XO drive train along with high-powered Avid Elixir 5 hydraulic disc brakes and Avid 200mm HS1 rotors. Brakes of this caliber are highly rare on any electric bike, much less one that retails at this price level. The rigid frame of aircraft-grade aluminum is well suited for more aggressive riders, and the leather grips and Gyes leather saddle provide outstanding comfort. What’s more, the Outlaw SS includes frame mounts for water bottles and fenders. These are welded either directly to or through the frame. In so many ways this impressive, rock-solid bike was created to break the rules. Dispose of your motorcycle and climb aboard an Outlaw SS today. The difference between this new version, 3.5, and version 3 is that this comes with a higher capacity 12ah battery. 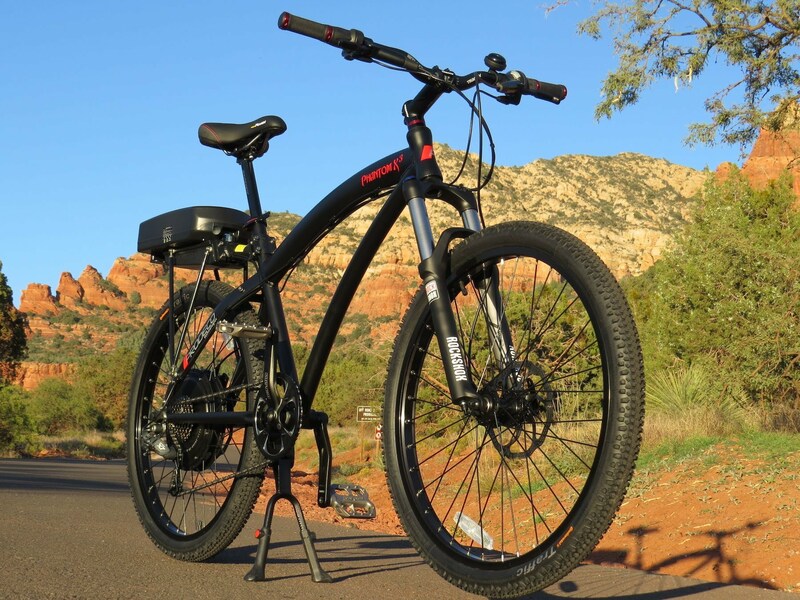 This black pearl metallic gloss version of the Stride 500 is an e-bike that promises comfort and a smooth ride for all levels of riders. Combining a superior-strength, high-torque 500-watt direct-drive motor mounted in the rear wheel, which delivers 720 watts at peak, with a high capacity 36-volt, 12-amp hour advanced lithium ion battery (LiFePO4), you are guaranteed to enjoy a long ride around town. 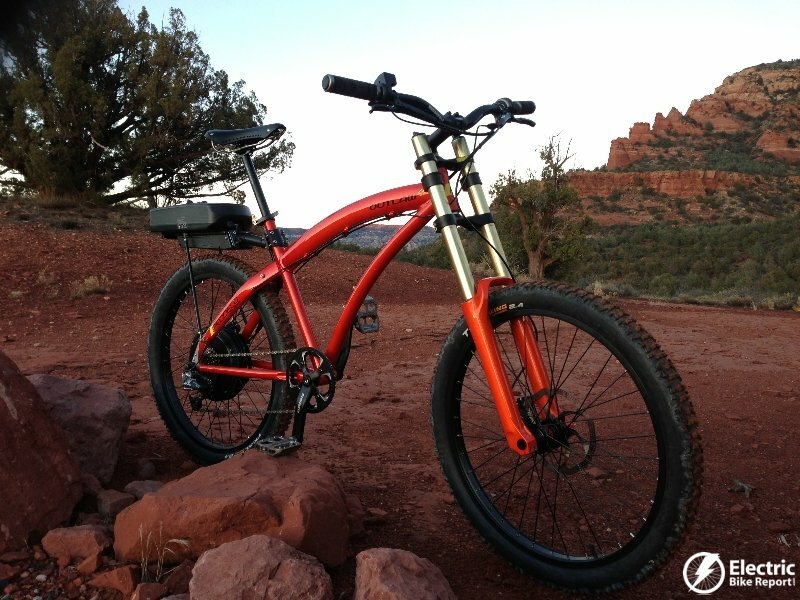 This step-through, aluminum rigid frame bike brings new meaning to the term “ease of use.” You will also love the Avid BB7 180mm HS1 Disc brakes for the best in heat shedding, not to mention the SRAM X7 Twist 8-speed shifter and the ultra durable Conti Town & Country 26 x 2.1 tires which are well known for stability and traction. Just give the throttle a half twist to activate the “power-on-demand” propulsion system and reach speeds of up to 20 mph on the Stride 500. 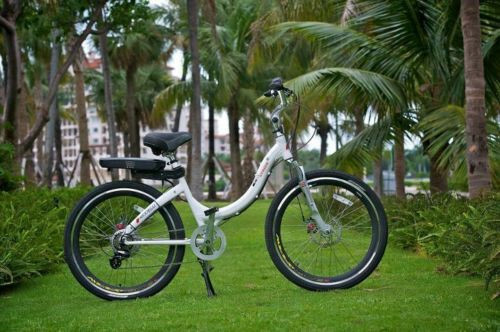 The battery delivers up to 50 miles per charge and an effortless ride while offering the option of pedaling for exercise. The comfort is unmatched, with a solid, step-through frame for easy mount and dismount, plus an oversized vented saddle for cushion. This bike is suited for all levels of riding thanks to universal adjusting capabilities.